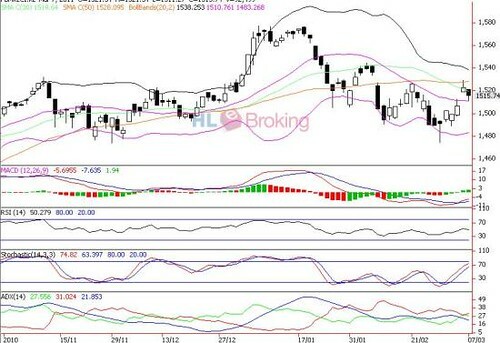 KLCI Is Likely To Consolidate Around 1500 After The Shooting Star Formation Last Friday. Share prices on Bursa Malaysia ended lower, in line with regional markets and the weaker close on Wall Street last Friday. Trading remained uninspiring with the ongoing conflict in oil-rich Libya continuing to rattle investors. FBM KLCI went down 6.87 points or 0.45% to close at 1,515.74. Sentiment was also affected as Moody slashed Greece credit ratings by three notches to B1 from Ba1 with a negative outlook. The KLCI tumbled as much as 11.3 points before ending 6.9 points lower at 1515.7. Market breadth was negative with losers beat gainers by 583 to 185 while volume fell to 715 million shares valued at RM1.09 billion from 1.13 billion shares valued at RM1.9 billion last Friday. Despite improving technical readings following the 1% rally last Friday, yesterday’s sharp drop in trading volume and value, due to nagging external concerns, could temporary weaken the rebound from the 1474 low on February 28. In addition, narrowing Bollinger bands and failure to break above the 50-d SMA (1528 points) could signal more consolidation ahead. Immediate upside targets are 1528 and 1538 (upper Bollinger band) whilst major supports are situated around 1510 (mid Bollinger band), 1500 and 1483 (lower Bollinger band).